Last year was a tough balance between the blog and the day job, and I've done a few interviews recently and been asked if I'll ever take the blog full time. The short answer is no. Whilst I completely respect those that do, it's not for me. I think that (for me personally) I'd struggle not to become a little self obsessed if everything I worked for revolved around me and my appearance on the internet. I need to do something that isn't about me, that's a job, thats building something with people... The summit we did with work (here) really got me excited; it was the first time since I started that I really saw why we all work so hard at growing our company. So, what does this "year of refinement" mean for the blog? Well, as ever my content is a true reflection of whats going on with my life/plans/style. So, you'll hopefully start to notice a "less is more" thing. It's tricky not to be a magpie, particularly when I'm lucky enough to be offered quite a few nice things every week, but I want to really create a firm style and direction. It's going to be a challenge - I love my brights and florals as much as my stripes and denims... so lets see where it goes! 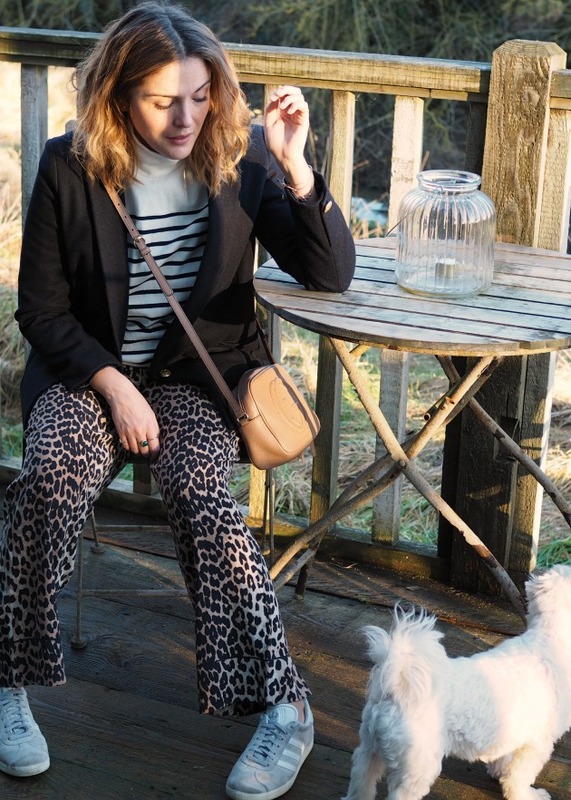 This snap was taken when Rhian and I stayed up at Soho Farmhouse last month. We had a meeting nearby and the rooms were super cheap so I thought we'd treat us (actually wasn't that much of a treat as midweek rates for members are really good). I'd never stayed with my own money before, other visits have all been on press trips and it was lovely to do it that way. Full control over my own time, no pressure to shoot pictures - I actually ended up taking more as a result! 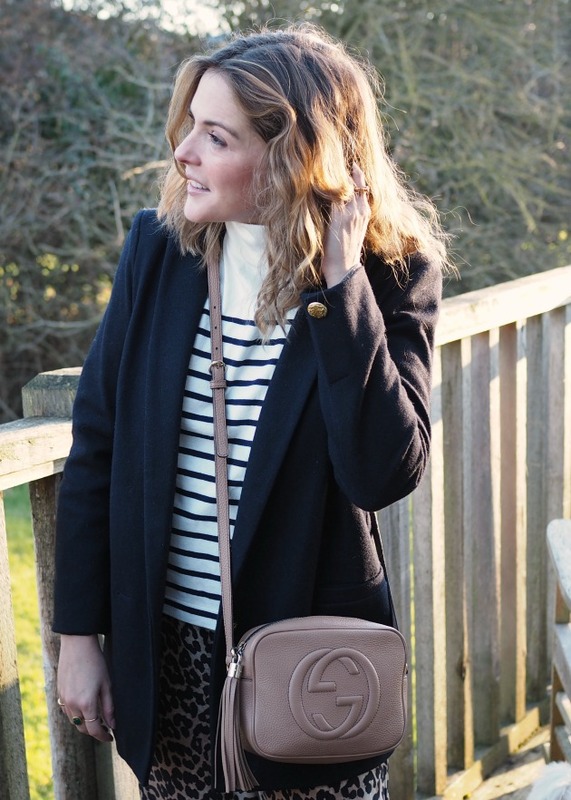 The outfit is very typical for me at the moment, I'm really loving blazers and bought this jacket from Vestiaire Collective between Christmas and New Year. I really love Ganni, but the price points sway from super reasonable to super pricey - VC's stuff is brilliant because as "second hand" it's way cheaper. This blazer still had the tags on, took a while to arrive but for £70 I didn't care. Shop their selection here, never fails to impress me whats available. 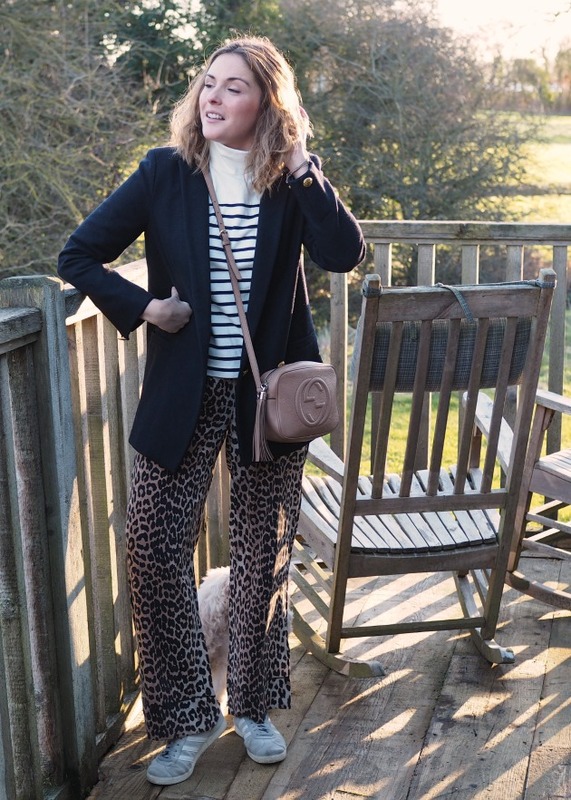 The stripes are J Crew (as they often are, it's them or Joules) and the trousers are also Ganni - I treated myself on Black Friday, they sell out very quickly but I found them here.